"I am honored and delighted to be with you today," beamed Beverly Ghent-Skrzynski, Rotary District 6630 Governor of Northeast Ohio, who was made an honorary member of Medina Sunrise Rotary. "In the words of Rotary International President Barry Rassin, 'Together in Rotary, we can Be the Inspiration -- with courage, optimism and creativity!" The District Governor's motivational speech for this first official club visit included her leadership role in representing the Rotary Foundation, in which we remain committed to win the good fight to "End Polio Now." 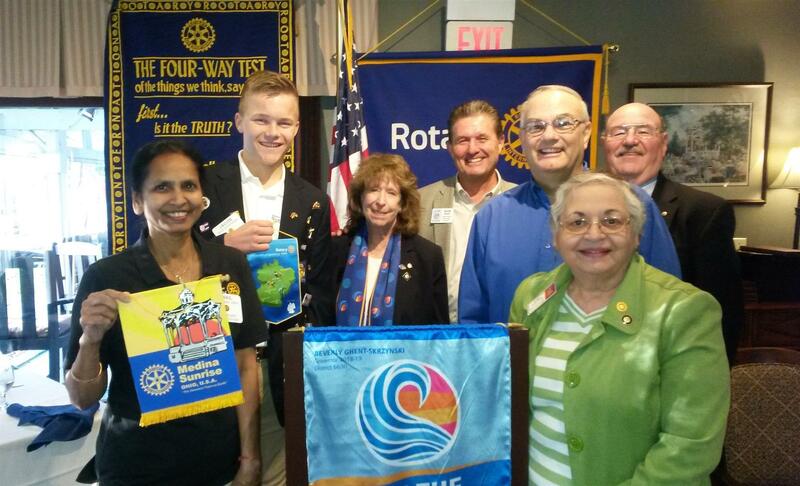 Beverly reviewed the distinguished history and involvement of Medina Sunrise Rotary in the local and international community, and encouraged a new initiative to engage and mentor youth and to welcome them into the Family of Rotary. As Rotary International and its 1.2 million Rotarians around the globe work together on humanitarian service and building world peace, may our membership continue to grow. Let our Rotary vision be inclusive in outreach and inviting to all those who wish to place "Service Above Self." Congratulations to 2018-19 President Shail Jain and the Medina Sunrise Rotary Club for reminding us that one person can make a difference -- but together, Rotary can change the world!